An estimated 40,000 women die each year from breast cancer and another 4,000 from cervical cancer according to the CDC. [i] One in eight women will be diagnosed with breast cancer in her lifetime and it is the fifth leading cause of death for women over 50 years of age. Breast and cervical cancer screening offer early detection and treatment for better outcomes and fewer deaths. Information about breast and cervical cancer screenings is widespread. Guidelines, headlines, and subject lines are put in front of women daily to remind them to make appointments and get tested. So why do screening rates continue to lag all our goals? Why are only 70% of targeted women seeking mammograms every two years, and less than 65% of eligible women are receiving recommended cervical cancer screening (PAP and HPV testing)? Many times, messages aren’t getting through the clutter of our busy lives. Some are numb to the messages as they relate to ourselves and our families. For others, the message isn’t culturally appropriate and doesn’t resonate with some of our most at-risk populations in a personal and engaging way. At HMS Eliza, we understand engagement and messaging. We have demonstrated the ability to motivate members to act and move populations when other forms of communications haven’t had the desired impact. By partnering with HMS Eliza to conduct a Women's Health Member Outreach and Engagement Program, a large regional health plan was able to increase member breast cancer screenings by 28% and increased member cervical cancer screenings by 23% over a control group not enrolled in the Eliza Women's Health Member Outreach Program. We believe that messages need to be tailored to the populations and personalized to the members to have the greatest impact. Eliza’s Women’s Health Member Engagement Program utilizes targeted member outreaches including phone calls, emails, text messages, and direct mail to uncover barriers to care and encourage women to have the appropriate screenings and preventative care services. 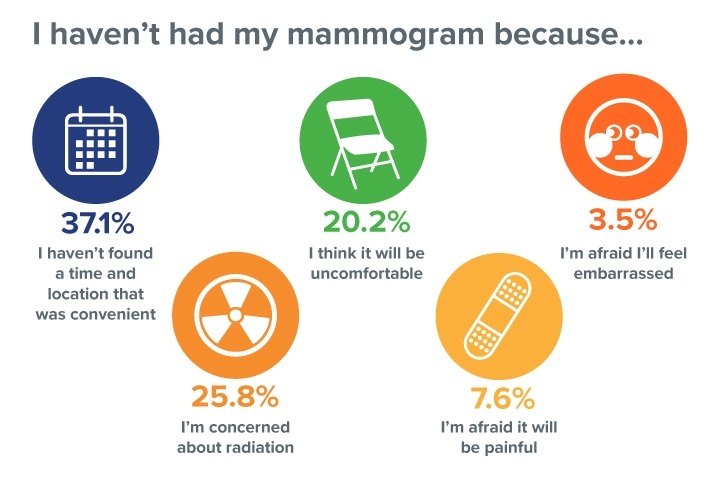 For example, in a recent survey, we found that 37% of women stated they hadn’t had a mammogram because they were unable to find a convenient time or location. To address this barrier to care, HMS Eliza customers can choose to include direct appointment scheduling in their member outreach and engagement program to close gaps in care and increase breast cancer screening rates. Early detection and treatment of breast and cervical cancer saves lives. The best way to cheat these cancers is through simple, proven screenings. Let’s not be satisfied with 70% compliance when 80+% percent is well within our reach. We can be doing more for women's health.